After a record year of fundraising, St. George’s Ladies of Elks (LOE) members celebrate their community outreach and engagement efforts by giving more! St. George, UT – The Dixie Ladies of Elks are pleased to announce on Tuesday, April 28, 2015 the organization presented 2 checks totaling $3,000 to local nonprofits making an impact in the Southern Utah Community. Through their efforts the LOE support vital programs and services that build stronger communities through programs that support youth, serve veterans, and meet needs in areas where Elks live and work. Locally LOE helps to fund organizations such as Camp Wapiti (a summer camp for medically challenged children), Boy Scouts, Girl Scouts, the Erin Kimball Foundation, an annual Eye Fair (providing exams and glasses to children in need), the Millcreek Pantry Project, St. George Children’s Museum, Washington County Youth Crisis Center, the XP Foundation, the Grace Episcopal Church Soup Kitchen as well as Scholarship Funds at Dixie State University. 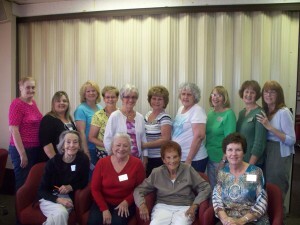 Dixie LOE programs are also supported on a national level through the Elks National Foundation (ENF). At its February meeting in Tucson, Arizona, the Elks National Foundation Board of Trustees approved appropriations and distributions for the 2016 fiscal year totaling a record $28.95 million. It is important to note that though their giving continues to rise, the fundamental expenses of the foundation are just 7.9%, far below the Better Business Bureau’s standard for charities of no more than 35 percent of total spending. In the state of Utah this support represents a rate of return ratio of 1.803 on every dollar the ENF receives from Utah Elks. Those funds were in addition to the Elks National Foundation’s Community Investments Program which invested $8.68 million in Elks communities through Lodge grants which enable Elks meet local needs. In 2013-14, Elks across the country volunteered more than 336,500 hours through CIP grants. For the 2013-14 fiscal year alone, the CIP awarded a total of $56,000.00 to 9 Utah Lodges. “Elks Lodges bring so much more to their communities than just a building, golf course or pool and we are striving to share this message. Lodges like ours are places where neighbors come together, families share meals, and children grow up.” said McConnell. Organizations such as the Erin Kimball Foundation and the St. George Children’s Museum play a pivotal role in building better communities. To be successful and create sustainability they rely on local partnerships and the generosity of community minded organizations such as the Dixie Ladies of Elks. The Benevolent and Protective Order of Elks (BPOE) of the United States of America boasts nearly one million members in its 141-year history with a network of more than 2000 lodges in communities across the country. 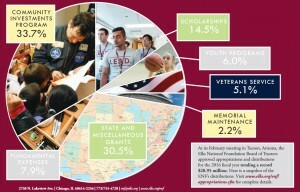 The BPOE invests more than $80,000,000 each year to benevolent, educational and patriotic community-minded programs in such fields as benefitting physically handicapped children, sponsoring Elks National Foundation scholarships, scouting, athletic teams, veterans’ works, a national “Hoop Shoot” free-throw contest involving more than 3 million children, physical and occupational therapy programs and patriotic programs. The Elks National Foundation is a registered 501(c)(3) public charity. The learn more about the foundation or to find a lodge in your community visit: www.elks.org. The Erin Kimball Foundation serves homeless survivors of domestic violence and abuse. The foundation has provided over 210,000 safe nights in apartment type settings to over 165 survivors and 345 children. There is not a demographic untouched by domestic violence, so participants have come from all walks of life, ethnic and religious back grounds. The foundation exists to serve any individual that has experienced domestic violence. To learn more about the Erin Kimball Foundation visit: www.erinkimball.org. The St. George Children’s Museum’s (SGCM) mission is to provide vibrant and engaging interactive activities that invite children and families to discover, imaging and create. To accomplish this mission the SGCM welcomes and encourages all children to appreciate the power of play and exploration. As part of this process, SGCM seeks to be a creative space that develops confident, informed children who are excited by inquiry and the world around them. To learn more about the St. George Children’s Museum visit: http://www.sgchildrensmuseum.org.